Prospects for a legal challenge to Labor’s 37-vote win, as the AEC prepares to press the button on Senate election counts across the country. So then. New South Wales as expected: 1. Payne (Lib); 2. Dastyari (ALP); 3. Sinodinos (Lib); 4. McAllister (ALP); 5. Nash (NAT); 6. O’Neill (ALP); 7. Fierravanti-Wells (LIB); 8. Cameron (ALP); 9. Rhiannon (GRN); 10. Williams (NAT); 11. Burston (PHON); 12. Leyonhjelm (LDP). 1. Brandis (LNP); 2. Watt (ALP); 3. Hanson (PHON); 4. Canavan (LNP); 5. Chisholm (ALP); 6. McGrath (LNP); 7. Moore (ALP); 8. Macdonald (LNP); 9.Waters (GRN); 10. O’Sullivan (LNP); 11.Ketter (ALP); 12.Roberts (PHON). The primary vote front-runner, Gabe Buckley of the Liberal Democrats, received a remarkably weak flow of preferences, and Roberts was further able to pull ahead of the Nick Xenophon Team, Family First, Katter’s Australian Party and Glenn Lazarus Team candidates at various points in the count. The chart below shows the results at Count 9, at which point Pauline Hanson was elected and her surplus flowed on to Roberts, and the race for the final three positions out of the last nine surviving candidates. The AEC has announced the button will be pressed in Queensland at 9am, with New South Wales apparently likely to follow either late today or some tomorrow. I’ve now done a spreadsheet for Western Australia, to go with the one I did earlier for Tasmania, showing the frequency with which voters for the various parties included the various other parties in the top six of their preference order (which in most cases means giving them a preference full stop, since most voters simply numbered six boxes above the line). As before, each party’s first preference vote and preference allocations are listed by row, and there are separate worksheets accessible at the bottom left for above-the-line and below-the-line votes. 1. Fifield (Lib); 2. Carr (ALP); 3. Di Natale (GRN); 4. McKenzie (NAT); 5. Conroy (ALP); 6. Ryan (LIB); 7. Collins (ALP); 8. Paterson (Lib); 9. Marshall (ALP); 10. Hinch (DHJP); 11. Rice (GRN); 12. Hume (Lib). 1. Birmingham (LIB); 2. Wong (ALP); 3. Xenophon (XEN); 4. Bernardi (LIB); 5. Farrell (ALP); 6. Griff (XEN); 7. Ruston (LIB); 8. Gallacher (ALP); 9. Fawcett (LIB); 10. Kakoschke-Moore (XEN); 11. Hanson-Young (GRN); 12. Day (FFP). A defeat for Labor as the fourth candidate on its ticket, Senator Anne McEwen, loses out to Bob Day of Family First. McEwen had 39,378 votes after the surplus from the third-placed Labor candidate was distributed, ahead of Bob Day on 31,548. As the table below illustrates, McEwen maintained a lead of 50,515 to 44,907 as the various also-rans were excluded, leaving candidates of six substantial parties competing for the last three seats. However, the exclusion of the fifth Liberal, Senator Sean Edwards, unlocked a decisive flow of preferences to Day, a considerable number for the third Nick Xenophon Team candidate, Skye Kakoschke-Moore, and pitifully few for McEwen, and fewer still for the Greens Senator Sarah Hanson-Young – who nonetheless came within 16 votes of a quota at this point of the count. Then followed the exclusion of One Nation, and an approximately equal flow of preferences to Day and the Kakoschke-Moore, and much fewer to McEwen and Hanson-Young, although sufficient for the latter to win election at this point. This left Day to a still greater lead over McEwen, which was dented only slightly by the distribution of Hanson-Young’s surplus. 1. Cormann (LIB); 2. Lines (ALP); 3. Ludlam (GRN); 4. Cash (LIB); 5. Sterle (ALP); 6. Smith (LIB); 7. Dodson (ALP); 8. Reynolds (LIB); 9. Back (LIB); 10. Pratt (ALP); 11. Culleton (ONP); 12. Siewert (GRN). The outcome of the final seat appeared to be up in the air before the count was finalised, with preferences set to determine the winner out of Rachel Siewert and Kado Muir of the Nationals. In the even, Siewert did it surprisingly easily. With the election of Louise Pratt to the tenth seat and the distribution of her small surplus, two seats remained to be filled with three candidates left in the count, of whom Rod Culleton of One Nation had 104,782 votes, Siewert 936,266, and Muir 67,657. First up, The Australian reports that “the Senate count is also due to be finalised this week, with results to be known in South Australia and Western Australia tomorrow, Victoria and Queensland on Tuesday, and New South Wales on Wednesday”. The other big news today was the finalisation of the recount in Herbert, which delivered Labor a final winning margin of 37 votes. The AEC should declare the result some time this week and must return the writs by next Monday, initiating a 40-day period inal which a challenge can be made before the High Court, sitting as the Court of Disputed Returns. This court can either uphold the result, reverse it, or order a fresh election. Overturning could conceivably happen if the court ruled ballot papers had been incorrectly interpreted, or declaration votes wrongly excluded. However, all the talk has been of a by-election initiated on the basis that voters had been wrongly denied votes in numbers exceeding Labor’s winning margin. There are three stories circulating as potential basis for such a challenge: the Australian Defence Force’s confirmation of a failure to vote by 628 Australian Defence Force personnel participating in Exercise Hamel, a military exercise conducted around Port Pirie, Port Augusta and Whyalla in South Australia, including up to 85 who might have been based in Townsville; claims that people were unable to lodge absent votes in the neighbouring seat of Kennedy due to a shortage of ballot papers; and a statement Senator Ian Macdonald says he has from medical staff a Townsville Hospital that AEC officials neglected to provide ballots in a particular hospital ward. A number of legal precedents are of note here. At the Queensland state election in July 1995, the Labor government under Wayne Goss eked out a one-seat victory that depended on a 16-vote victory in the Townsville seat of Mundingburra. This result was voided by the Court of Disputed Returns on the grounds that 22 military personnel serving in Rwanda did not receive the postal votes they applied for in time due to a transportation bungle by the Australian Defence Force, combined with errors made by the Electoral Commission. A by-election was ultimately held the following February and won by the Liberals, resulting in the fall of Goss’s government. On a purely legal level, the relevance of a case centred on postal votes to the claimed irregularities in Herbert is limited. However, the centrality of Defence Force personnel to the Coalition’s case is very important as a matter of political strategy. The Murringburra by-election was followed at the end of that year by another litigation-initiated electoral re-match — this time in the federal seat of Lindsay in western Sydney, where Jackie Kelly’s win for the Liberals had been overturned on grounds of her employment by the RAAF, an “office for profit under the Crown”. On that occasion, Labor was humiliated when voters gave Kelly a further 5.0% to add to the 11.8% swing she received at the election. If a fresh election in Herbert is to have any chance of being to the Liberals’ ultimate advantage – a very dubious proposition under the best of circumstances – it is crucial that it be presented as a means of redressing the disenfranchisement of military personnel, and not the sort of sore loser act Labor was indulging in in Lindsay. The second clearly relevant precedent from federal level was the seat of Ballarat at the 1919 election, when Labor’s Charles McGrath was defeated by Nationalist candidate Edwin Kerby by a margin of one vote. This was overturned on the grounds that a handful of voters had been wrongly denied ballots due to various official errors, which in two cases involved voters being denied absent votes. At that time, polling stations were issued with blank ballot papers for absent voting, on which officials would fill out the names of the candidates for the relevant division and provide them to the vote. However, a polling station in Corangamite ran out of such papers, and the presiding officer advised deprived voters to await the arrival of new papers. None arrived, and after several hours, the officer decided instead to issue altered ballot papers for Corangamite – but by this time, two affected voters from Ballarat had given up and gone home. In response to this episode, a number of legislative changes were made in 1922 – one of which proved to be significant after the Western Australian Senate election was botched in 2013, and another of which has an important bearing on the present circumstance. In determining whether the official errors in Ballarat at the 1919 election were sufficient to warrant a fresh election, the court deemed it material that the deprived voters had intended to vote in a way that would have changed the result. It was felt this violated the secrecy of the ballot, so the Electoral Act was changed to specify that no such evidence was to be admitted. After the 2013 election, this section was invoked to refute the argument that the voting intention of the 1375 voters whose ballots had gone missing during the WA Senate recount should be ascertained with reference to the first count. This changed to the act widened the scope for potential challenges, so the 1922 amendments also imposed limits on who could give evidence about having been denied a vote. This survives today as section 367 of the Electoral Act, which allows evidence to be admitted only from those who made a claim to vote. Media reports say the AEC set up seven polling stations within the Exercise Hamel area at which 1274 votes were cast, and that a further 1371 force members were taken to vote at surrounding population centres. However, 628 did not cast votes for reasons the Defence Department has declined to shed further light on. Unless these members actually fronted up to vote and were knocked back, section 367 would allow no basis for the court to hear their complaint. As well as that, the Courier-Mail reports the Liberal National Party has written to postal vote applicants in an attempt to identify anyone who failed to receive their ballot paper. The party’s efforts to cover all bases calls to mind another legal challenge at state level in Queensland, following Labor’s 74-vote victory in the Brisbane seat of Chatsworth in 2009. An LNP fishing expedition cited 130 postal vote applications for which no vote was processed, 30 cases of multiple voting, and various other bits and pieces. Most of these were deemed to have had innocent explanations, and the 10 genuine discrepancies that were identified were too few to influence the result. But with the federal division of Herbert having three times as many voters as the state district of Chatsworth, and fewer than half as many votes having decided the result, there seems to be an even money chance that a court challenge will give the Coalition what it appears to believe it wants. Labor ends a Herbert recount process 37 votes ahead with one more check of preference votes to go, and the Greens sneak over the line for a second Senate seat in Tasmania. The preference distribution process in Higgins has resulted in tiny changes, never more than one vote in either direction per polling booth, that have collectively added three votes for Labor and taken three from the Liberal National Party, increasing the Labor margin from 35 to 41. The last word from the AEC was that this would be finalised tomorrow. In other late counting news, One Nation candidate Lynette Keehn has overtaken Labor to reach the final count in the regional Queensland seat of Maranoa. This is a feat no party candidate other than Hanson herself was able to achieve at the party’s high-water mark election of 1998. However, the Nationals-aligned Liberal National Party candidate, David Littleproud, has 49.2% of the primary vote and will easily win the seat, which is vacated by the retirement of Bruce Scott. Labor edged One Nation on the primary vote by 18.3% to 17.8%, but One Nation pulled ahead after distribution of preferences. The Greens achieved in a similar feat in Tony Abbott’s seat of Warringah, pulling ahead of Labor after trailing 14.8% to 12.2% on the primary vote, with Tony Abbott on 51.6% and independent James Mathison on 11.4%. A two-party count has now been completed in the seat, giving Abbott a winning margin over the Greens candidate of 11.6%. In seats where non-traditional two-party outcomes were correctly anticipated by the AEC, we are now at the stage where Labor-versus-Coalition preference counts are being conducted, which will ultimately allow a national two-party preferred result to be determined. Such counts have been completed for Denison (a 15.3% margin for over Liberal) and Kennedy (a 6.9% margin for the Liberal National Party), and are in progress in the three Labor-versus-Greens seats in Victoria, Melbourne, Batman and Wills (barely started in the first case, nearly finished for the second and third). Both factors have caused an illusory surge for Labor in the published national two-party preferred tally published by the AEC. Warringah and Maranoa are excluded from this tally for the time being, but we know the results favoured the Coalition by 52,923 to 33,743 in Warringah and 60,771 to 29,228 in Maranoa, and that these numbers will ultimately be added back into the count. Furthermore, the seats awaiting to be counted on a Coalition-versus-Labor basis are almost all conservative (Barker, Grey, Higgins, Indi, Mayo, Murray and New England), the sole exception being Grayndler. When all votes are added to the count, the Coalition should have a final two-party preferred total approaching 50.5%. • The early stages of the preference distribution in Herbert, which is expected to be completed over the weekend, has resulted in Labor losing a vote at the Kelso booth and the LNP losing one at Riverside, leaving the Labor lead unchanged at 35 votes. • I’m hearing that the button the Senate count in Western Australia will be pressed on Monday. Particularly striking is the failure of voters to have followed how-to-vote cards, even in the case of the major parties who had the base of volunteers needed to disseminate them … fewer than one-in-ten Liberal voters chose to be guided by the party’s card — which, remarkably, recommended a sixth preference for Labor — while the share of Labor voters that did so barely even registered. It should not be presumed, however, that voters reluctant to toe the party line instead gave expression to finely calibrated rational choices. Ballot paper ordering had a substantial influence on preferences, leading to a kind of “soft” donkey voting, in which those who find their favoured party near the front end of the ballot paper tended to remain there when allocating subsequent preferences. Part of my homework for the article included the development of this spreadsheet (note there are separate worksheets for the total result, above-the-line votes only and below-the-line votes only) which identify the frequency with which voters for each party (in rows) included each other party (in columns) in their top six. Kevin Bonham has put precise figures to the meagre rate of how-to-vote card adherence for the various parties, and David Barry has a nifty tool for exploring preference flows with greater precision than my own spreadsheet. The Tasmanian count ended with Richard Colbeck dropping out, and the final result being determined in favour of Nick McKim over One Nation by 141 votes. Result: 1.Abetz (Lib), 2.Urquhart (ALP), 3.Whish-Wilson (GRN), 4.Lambie (JLN), 5.Parry (Lib), 6.Polley (ALP) 7.Duniam (Lib), 8.Brown (ALP), 9.Bushby (Lib), 10.Singh (ALP), 11.Bilyk (ALP), 12.McKim (GRN). Richard Colbeck’s below-the-line support wasn’t quite enough to keep him ahead of One Nation’s Kate McCulloch after preferences. Colbeck began the count with 13474 votes to McCulloch’s 8641, but McCulloch was the direct beneficiary of above-the-line preferences to One Nation, whereas above-the-line preferences to the Liberals were soaked up by David Bushby, who held the place above Colbeck on the Liberal ticket. By the key point in the count, McCulloch’s vote had swollen to 18136, whereas Colbeck had to rely entirely on below-the-line preferences to reach 16918, 1218 astern of McCulloch. Colbeck’s exclusion then unlocked a flood of preferences that were easily enough to elect Bushby, but also to just push Lisa Singh over the line with a gain of 2171 – evidently she garnered substantial support even from right-of-centre below-the-line voters. Then came the distribution of the fairly substantial Liberal surplus, from which Labor did remarkably well, gaining 4412 votes compared with 2242 for One Nation and 1269 for the Greens, with 2816 exhausting. Presumably the Liberals’ remarkable decision to recommend a sixth preference to Labor had a fair bit to do with this. However, this was not decisive, and purely influenced the size of Catryna Bilyk’s margin over Nick McKim and Kate McCulloch in taking the eleventh seat (notably, fourth-placed Bilyk was elected later in the count than sixth-placed Singh – fifth-placed John Short lost out altogether). That left the twelfth seat as a race between McKim and McCulloch that began with McKim leading by 43 votes, ahead of the distribution of Labor’s 593-vote surplus. Those votes went 234 to McKim and 136 to McCulloch with 221 exhausting, and McKim carried the day by a margin of 141. The recount of the primary vote and the indicative two-party count has now been completed with the latter showing Labor 37 votes ahead, after adjustments to nine polling booths cut Labor back by 34 votes while reducing the LNP by one vote; the pre-poll count added four for the LNP and reduced Labor by three; and two was added to Labor’s total on postals. Now the count will proceed to a full distribution of preferences, beginning with the last placed Palmer United, who were pretty bold fielding a candidate given the local circumstances (he polled 316 votes, or 0.36% of the total). In theory, this should end by confirming the result of the indicative count, but the process of reviewing preference votes will surely turn up further minor anomalies. Should Labor’s win be confirmed, the Coalition is gearing up for a legal challenge based on suggestions up to 85 defence personnel stationed in the electorate were deprived of a vote because insufficient voting facilities were provided during an exercise being conducted South Australia, and 39 Townsville Hospital patients were denied a vote when they attempted to do so during the final hour of what should have been the polling period on election day. Michael Maley, a former Australian Electoral Commission official, has noted in comments that Section 367 of the Commonwealth Electoral Act would set a high bar on the defence personnel issue especially. The hospital issue could prove more problematic, depending on what the circumstances prove to have been. Equally excitingly, it appears we are now finally to get to the business end of Senate counting, with Kevin Bonham hearing informally that the button will be pressed on the Tasmanian result tomorrow afternoon – although the AEC is being a little more circumspect publicly. The intricacies of the count have been explored in headache-inducing detail on Kevin’s blog – to cut a long story short, there look sure to be five Labor, four Liberal, one Greens and Jacqui Lambie, with the last seat up for grabs. He deems, without huge confidence, the order of likelihood for the final seat to be a second Green, a fifth Liberal, and One Nation. It appears almost certain that below-the-line votes will overturn the order of Labor’s ticket to deliver a seat to sixth-placed Lisa Singh at the expense of fifth-placed John Short. Richard Colbeck, the fifth-placed Liberal candidate, has also benefited from a backlash against his party’s ticket order, but not to the extent of overtaking fourth-placed David Bushby. However, it’s on the strength of his own votes that Colbeck will linger to the final stages of the count and leave the Liberals in the hunt for a fifth seat. The question is whether he finishes ahead of the One Nation candidate, in which case he could potentially end up ahead of the second Green, Nick McKim, if a generally right-of-centre pool of micro-parties preferences favour him with sufficient force – although it would be a tall order. If Colbeck drops out, it comes down to McKim versus One Nation, to be determined mostly by Liberal preferences, which would need to flow massively to One Nation for McKim to be defeated. A performance review of a polling industry that did uncannily well in measuring national voting intention, but was all over the shop in its seat polling. I’m piecing together an article on opinion poll performance at the federal election for Crikey, to which this post is intended as a sort of appendix (UPDATE: And here it is ($)). So far as national polling is concerned, this accounting from ReachTEL speaks for itself, as the primary vote percentages have hardly budged in the week-and-a-half since it was published. The one big outstanding issue is that we don’t yet have a reliable national two-party preferred total, as there are 14 electorates where preferences haven’t been counted on a Labor-versus-Coalition basis. My back-of-envelope reading is that the final result will be about 50.5-49.5 in favour of the Coalition, and it’s on this basis that I’m proceeding here. The thrust of the Crikey article is that seat polling did not perform terribly well, and that it failed in an interestingly consistent way that you’ll have to read Crikey to learn more about (UPDATE: Did I mention that it was here?. I’m aware of 81 seat polls conducted over the course of the campaign, of which 62 were conducted for media outlets and 19 were conducted privately (excluding a few for which results were not provided with sufficient detail). The following table records the polls’ average biases, which refers simply to the difference between poll results for a given party and the election results and does not imply anything sinister, and errors, which do the same in absolute terms without being concerned with whom the error favoured. For consistency of comparison, this accounting excludes 12 polls that were not Labor-versus-Coalition contests, which you can learn more about at the bottom of the post. A look at the two-party bias measures might suggest that ReachTEL outperformed Galaxy (which in this table is taken to include the polls it conducted as Newspoll), but I’m inclined to give Galaxy the honours because ReachTEL polls tended to have two errors that cancelled out: an understatement of the Labor primary vote, and an overstatement of the minor party and independent preference flow to Labor. ReachTEL’s headline figures were from respondent-allocated preferences, whereas Galaxy’s were based on preference flows from the 2013 election (which at a national level understated the preferences flow to Labor this time – the jury is still out on which of the two methods produced the smaller errors). ReachTEL’s success in pitching its electorate polls to private clients resulted in a large amount of detailed private polling emerging in the media, which is not something we have seen much of in Australia in the past. The 19 such polls identified here were, remarkably enough, nearly all conducted for left-of-centre concerns, namely trade unions and GetUp! There is some evidence of selection bias here, by which those commissioning the polls are more likely to publicise the results if they find them to their liking. The two-party bias for the private polls leans in the other direction from the media polls, and while the private polls are recorded as landing slightly nearer the mark, the gap would have closed had I not excluded a poll commissioned by Labor’s candidate in Wentworth that wrongly picked a 10% swing against Malcolm Turnbull, on the basis of insufficient detail was published. The chart below offers another view of the waywardness of the seat polls, with the spread of biases in the two-party preferred results illustrated by the blue histogram – so for example, 16% (11 out of 69) came in between 0% and 1% too high for the Coalition. 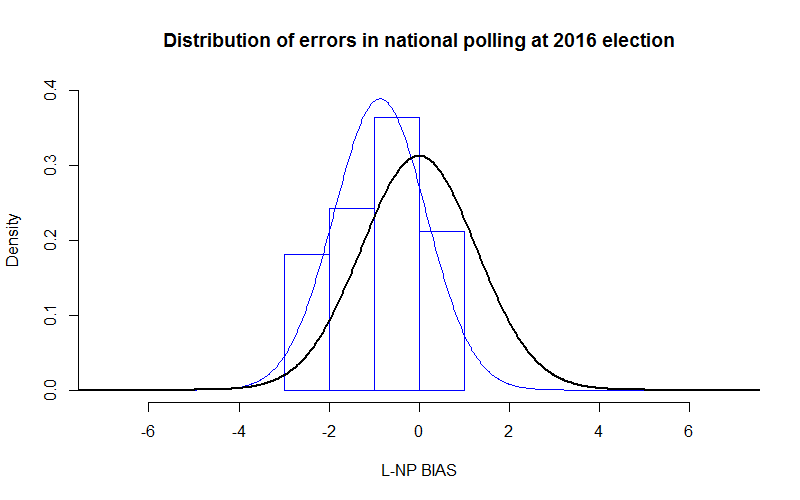 This is overlaid by a blue distribution curve that best approximates the spread of the results in the histogram, and a thick black curve that shows how the curve would have looked if the polls behaved as they should have, taking into account a 4% margin of error associated with polls with a sample of 600. The flatness of the blue curve relative to the black one illustrates the point that seat polls behaved is if they had a margin of error more like 7% than 4%, and its right-of-centre placement illustrates a statistically significant 1.3% bias to the Coalition. When the same exercise is conducted across the national polling, from which we have a rather more limited sample of 33 polls, there is a strikingly different result. This time the black curve shows how we would expect a distribution to look for polls with a margin of error of 2.5%, associated with a sample size of around 1500, which is about what you get these days from Newspoll/Galaxy and Ipsos in particular. 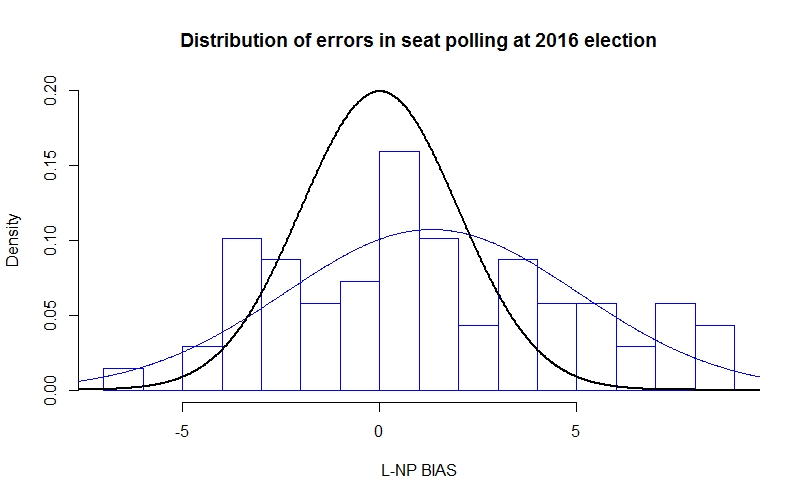 The histogram illustrates that Coalition two-party results were all between 48.5% and 51.5%, which is to say that the errors covered a very narrow range from -3% to 1%. The blue curve, being taller than narrower than the black one, tells us the range is narrower than you would expect given the margin of error, with the polls behaving more like they had a margins of error of 2% than 2.5%, and samples of 2400. This time the bias is slightly in favour of Labor, at 0.9%, but this can partly be accounted for by the fact that many of the polls were conducted early in the campaign period, and there appeared to be slight movement to the Coalition over the full course of the campaign. That the pollsters should outperform the theoretical expectation is quite remarkable, given sampling error is the only kind of error the theory acknowledges, and we would expect further issues to arise from different polling methods and rising non-response rates. This raises a suspicion that we are witnessing the herding effects that so blighted polling in Britain before the general election there last May, at which support for the Conservatives was uniformly measured at 6% below the actual result. If so, the very big difference in Australia is that the pollsters have herded at the right place. Finally, a listing of the 12 seat polls that didn’t fit the Labor-versus-Coalition metric, and were thus excluded from the table above. Note that “OTH” refers to the main non-major candidate, rather than the combined vote for parties other than the Coalition, Labor and the Greens. The only comments I’ll add are that essentially none of them did well at predicting the Coalition vote, and the two Denison polls were even more skewed to the Liberals than the others in Tasmania, but with errors at the expense of Andrew Wilkie rather than Labor. A progressively updated post on the recount in the Queensland seat of Herbert, after the initial count was determined in Labor’s favour by eight votes. One was the possibility that soldiers based in Townsville were among 628 ADF personnel who were on Exercise Hamel in South Australia during the election campaign and did not cast their votes. The other is whether 39 patients at the Townsville hospital were denied a vote in the late afternoon of election day. Senator (Ian) Macdonald said he understood complaints were made to Townsville hospital staff that patients could not cast their ballots between 5pm and 6pm. Sunday night. It’s been an action packed first three days of recounting in Herbert, with Labor’s lead mounting from its starting point of eight to 13 on Friday and then to 16 on Saturday, before a reversal of fortune yesterday gave the LNP it’s present lead of one solitary vote. Adjustments have been made over the three days to absent votes (LNP up five, Labor up three) and pre-polls (Labor up 16, LNP up eight) and 11 of the 43 ordinary polling booths (Labor down 20, LNP down five). The two most substantial movements were at Railway Estate (LNP up 14, Labor down 16) and Belgian Gardens (LNP down eight, Labor down one). The Townsville and Kirwan pre-poll voting centres, which were revised heavily in Labor’s favour during the rechecking process, have respectively been changed to have the LNP down six and Labor up five, and the LNP up three and Labor down two. Friday 4pm. The Herbert recount, which the AEC says could take up to a fortnight, has begun with revision to the absent and pre-poll totals. I’m slightly puzzled by because it seems to involve admission of the last handful of unprocessed votes that have been listed as such for the past few days, or which four are now listed as outstanding. I’m seeking clarification on this from the AEC. The changes have been slightly to Labor’s net advantage, with pre-polls going 16-8 their way, although absents went 5-2 to the LNP. A progressively updated review of late counting, as the Coalition’s parliamentary majority hangs in the balance. Somewhat unexpectedly, the Australian Electoral Commission has announced it will proceed immediately to a recount in Herbert, despite its own policy saying it should first conduct a formal distribution of preferences to confirm that the margin is below the 100-vote threshold that triggers an automatic recount. According to the AEC press release, the decision was made “after judging that the margin between the two leading candidates, after a full distribution of preferences, would remain firmly in the scope of a requirement for a recount”. Criticism of the slow pace of the count may well have influenced the decision, with the press release hinting that its August 8 deadline for returning the writ may also have been a factor. There will now be another primary vote count with a concurrent two-party count, followed at last by the full distribution of preferences that will formally decide the result. The AEC says this will start tomorrow and “is expected to take approximately two weeks”. There was a remarkable turn of events in Herbert as the final declaration votes were mopped up, with Labor’s Cathy O’Toole drawing to an eight-vote lead over LNP incumbent Ewen Jones at the conclusion of the indicative two-party preferred count. This included 76 provisionals breaking 40-36 to Labor, 63 absents breaking 34-29 to Labor, 57 out-of-division pre-polls breaking 36-21 to Labor, and 28 postals breaking 16-12 to the LNP. Fairfax reports an AEC spokesperson saying a decision will now be made “whether to have a recount or a distribution of preferences”, but the AEC published a recount policy two years ago that makes it rather clear that it should follow the latter course. The next stop would thus be the exclusion of last-placed candidates and the distribution of their preferences until only two are left standing, which will surely mean O’Toole and Jones. In theory, this should conclude with O’Toole eight votes ahead, but it may be that the process turns up anomalies. If a final margin of less than 100 votes is confirmed, as seems all but certain, the entire process will be repeated with a full recount (although it would certainly be a lot quicker than the first count, since we are no longer awaiting late-arriving votes and processing declaration votes). It’s entirely possible that one of the two processes could switch the result. A recount after Clive Palmer’s win in Fairfax at the 2013 election increased his winning margin from 36 to 53; at the 2007 election, in the seat of McEwen at Melbourne’s northern fringe, a seven-vote winning margin for Labor on the first count flipped to a 12-vote win for the Liberals on the recount, which then became a 27-vote win after the Federal Court adjudicated on disputed ballot papers in response to a Labor legal challenge. The AEC says yesterday was spent checking declaration votes in Herbert against the electoral roll, allowing for all outstanding votes to be counted tomorrow. So I’ve marked the occasion by bumping this thread to the top of the page. Presumably there’s longer to go in Hindmarsh, where the number of unprocessed declaration votes is much higher. The chart below projects the results for both seats based on estimates of the outstanding number of formal votes and the existing two-party vote shares for each vote type. The “conversion” column refers to the rate at which processed declaration votes ended up in the tally as formal votes, and this is applied to the number of unprocessed votes to estimate the number of formal votes outstanding, which is displayed over the next two columns. On this basis, Labor stands to claw back two votes from its 12-vote deficit in Herbert, while increasing its margin in Hindmarsh (note I have had to work off 2013 numbers here for provisionals, since none have been counted yet). Very clearly though, Herbert could go either way, and we will have to await the preference distribution and a recount to be clear one way or the other. Meanwhile in Melbourne Ports, Kevin Bonham relates he has been “sent a scan of an indicative 3CP throw which shows Danby outlasting Hodgins-May by 802 votes”. This all but confirms that the Greens will be excluded before Michael Danby, who will go on to overtake the Liberals on Greens preferences and retain the seat. The number of votes left outstanding is small enough that there is probably not much to be gained from maintaining the projections. Herbert is still as tight as can be, and the count in Hindmarsh remains painfully slow, with hardly anything of substance having happened since Monday. In Herbert today, the first counting of provisionals favoured Labor 93-60, and a small batch of postals favoured the LNP 84-76. Overall, the LNP lead was cut from 44 to 12. “Envelopes awaiting processing” include 446 provisionals, 399 out-of-division pre-polls, 200 absents and 44 postals. That won’t necessarily amount to that many votes being admitted to the count, particularly in the case of provisionals. It would seem that 100 provisionals are likely to be added, which on past form would give Labor a net gain of 20. The LNP has had 53.6% of out-of-division pre-polls and 56.6% of postals so far, and Labor 51.6% of absents, suggesting the other outstanding votes are more likely to favour the LNP. Ultimately though, there is little enough in it that anything could happen, including the result coming out differently when the distribution of preferences is conducted, or in the recount that is likely to follow. For the second day in a row in Herbert, a big correction in Labor’s favour on pre-poll voting centre rechecking — this time from the Townsville centre — delivered a boost for Labor (Labor up 10, LNP down 101) that almost compensated for ongoing tide to the LNP on postals (554-460, although the last batch added favoured Labor 143-129) and out-of-division pre-polls (232-204). The combined effect was to stretch the LNP’s lead from 34 all the way out to 44. Based on the rate at which declaration votes issued translated into formal votes cast in 2013, I can’t see there’s much counting left to be done apart from late-arriving postals and, in the big hope for Labor, provisionals. Provisionals are few in number, with only 289 entered into the count in 2013, but almost invariably favour Labor. It’s probably discouraging for Labor that only 1134 provisionals have been issued compared with 1720 in 2013, but there may be a different dynamic this time for whatever reason. Still slow progress in Hindmarsh, with pre-polls favouring the Liberals 351-318, which does little to disturb a projected Labor winning margin of around 600. The LNP finally hit the lead today in Herbert, and in doing so have brought the “total ahead” tally in line with “total projected”. This happened despite a revision of the total at the Kirwan pre-poll centre putting Labor up by 83 and the LNP down by 65. The LNP lead is at 34, which is projected to increase by 100 or so in what remains to be counted. It was another slow day of counting for the second tightest seat, Hindmarsh, where rechecking cut the Liberals by 60 votes and Labor by 14. The only seats still of interest are Herbert and, arguably, Hindmarsh — the table below will continue to follow all designated counts, but the commentary will stick to those two. Labor’s raw lead in Herbert wore down from 178 to 66, with absents breaking 811-787 to Labor and out-of-division pre-polls going 423-329 the other way. The model’s projected winning margin for the LNP is up from 103 to 230. All that happened today in Hindmarsh was ordinary vote rechecking that cost the Liberals 30 and Labor 31. The ABC computer rang up a seventy-sixth win for the Coalition today in Capricornia, while Labor claimed victory in Cowan. Labor also looks increasingly likely to take Hindmarsh, and increasingly unlikely to take Forde. That just leaves Herbert, which continues to go down to the wire. Capricornia. The LNP’s grip strengthened today, to the extent that the ABC today credited as the decisive seventy-sixth seat confirmed for the Coalition. Added to the count today were 2434 postals and 1485, both of which were in line with a projection that points to an LNP winning margin approaching 1000 votes. Cowan. Labor claimed victory today after rechecking apparently turned up a pile of Greens preferences misallocated to the Liberals at the Tapping booth. Labor also got 55.8% from a batch of 2127 absents, although the first 1004 out-of-division pre-polls went 54.9% the other way. Labor’s raw lead has blown out to 946, which comes down only slightly on the projection. Flynn. I’m now projecting an LNP winning margin of 0.85%. Forde. The LNP winning margin is 0.57%, which I project to come down to 0.37%. Herbert. The LNP continues chipping away at Labor’s raw lead, which is down from 302 to 178 after postals went 561-435 to the LNP, and the first out-of-division pre-polls went 287-277. Hindmarsh. A big batch of 3781 absents gave Labor an anticipated fillip by breaking 54.7% their way, while another 1032 postals broke almost evenly. Labor’s lead has pushed out from 273 to 583, and looks unlikely to be reversed. Cowan. The odds of a Labor victory shortened a little further with 573 postals reversing the earlier trend in breaking 53.6% to Labor. The raw lead is now 513, which if anything seems likely to widen after the remaining absents are counted. That leaves the Liberals banking on a better-than-expected result on out-of-division pre-polls. Flynn. Just ordinary vote rechecking today, but it turned up a significant anomaly at the Wondai booth, where the LNP gains 54 votes and Labor loses 71. Hindmarsh. Not sure why, but the absent count went backwards today. I haven’t incorporated the change in the result published below. The Coalition moved into the lead on the raw count today in Capricornia and Flynn, which the projection has long tipped them to win. That just leaves Herbert with Labor ahead on the raw vote and behind on the projection, and the result there looks tighter than ever after today’s counting. Capricornia. The LNP has hit the lead on the raw count following a particularly good day today on postal votes, gaining 62.5% out of 1273. The first 1185 absents were lineball, in line with the projection. Very hard to see the LNP losing from here. Cowan. A second batch of absents calms Labor nerves by breaking 54.3% in their favour, having evidently been drawn from a more favourable area than yesterday’s batch. Ordinary vote recounting has results in a net loss to Labor of 27. Flynn. The first 776 absents break 54.6% to Labor, but they continue getting crushed on postals, the latest 1561 of which broke 61.7% to the LNP. That turns yesterday’s seven vote deficit into a 266-vote lead, although their projected winning margin is to three figures. Forde. The LNP scored 56.6% out of 1268 postals and 55.9% from the first 918 out-of-division pre-polls, although Labor continued to dominate absents on a second batch of 2311, breaking 57.3% their way. The ABC is now calling this for the LNP. Herbert. A slightly better day for Labor, who got 53.3% from the first batch of 885 absents, and had their lowest losing margin so far out of five days of postal vote counting, with the LNP getting 54.8% out of 970. 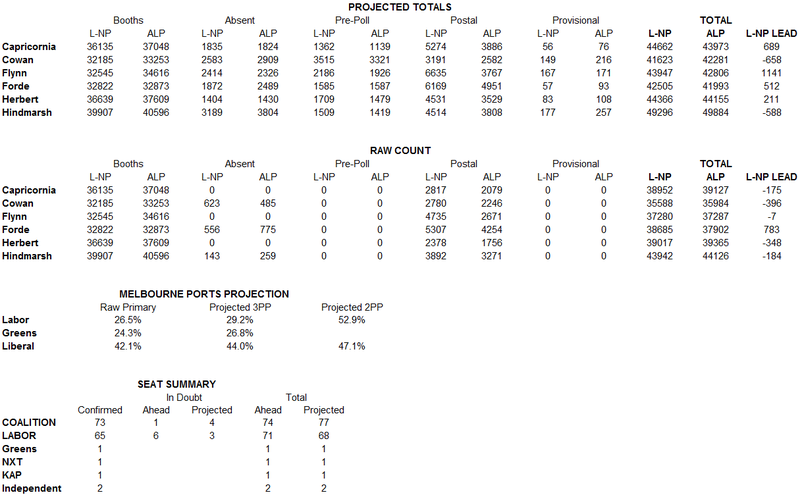 However, both results were right on a projection that has the LNP headed for a winning margin of around 300. Hindmarsh. A second batch of absents has followed the first in going heavily to Labor, who score 59.1% out of 528. The only other change today was ordinary vote rechecking, which gives Labor a net loss of 26. Of the four lineball seats in Queensland, the Coalition continues firming steadily in Capricornia, Forde and especially Flynn, while Herbert seems very slightly more likely to land their way as well. They have also had a fillip from the first absent votes in Cowan, but caution should be taken in extrapolating from this. The most likely Coalition total is 77, but Herbert could potentially lower it to 76. Capricornia. Today’s batch of 1464 postals went 60.1% to the Coalition, making them more like yesterday’s 59.2% than Wednesday’s 54.4%, and bringing the total postals counted so far right in line with the projection. While Labor retains a raw lead of 175, that’s not going to be nearly enough to withstand 4000 outstanding postals breaking at least 57-43 to the LNP. There are still no absents or out-of-division pre-polls in the count, but the 2013 precedent suggests they will be respectively neutral and favourable to the LNP. Cowan. The Liberals had a boost when they scored 56.2% out of the first 1108 absent votes, but the behaviour of absents can be highly variable between batches, and it may be that this one simply came from booths just outside the boundary at the seat’s Liberal-leading western end. Certainly Labor would hope so, because the Liberals will be on track for a win by about 350 votes if this result was borne out over the remaining 4500 or so absents. Ordinary vote rechecking gave Labor a net benefit of 31 votes. Nothing else added today. Flynn. What I suggested might be a trend of diminishing returns on postals for the Coalition has proved not to be, with today’s batch of 1954 going 67.1% their way, and around 3000 still outstanding. Labor’s raw lead is now just seven votes, and the projected Coalition winning margin is in four figures. Still no absents or out-of-division pre-polls though. Forde. The first batch of 1331 absents broke heavily to Labor, by 775-556, but not to an extent wildly out of line with the projection. Today’s batch of 3113 postals, which leaves at most around 2000 outstanding, also behaved predictably in breaking 55.0% to the Coalition. The Coalition’s raw margin was up from 687 to 783, which the projection has coming down to about 500 due to the trend to Labor on absents. Herbert. Another 962 postals behave similarly to previous batches in breaking 56.8% to the Coalition, leaving their projected winning margin at a fragile 211. Still no postals or out-of-division pre-polls, so this one is still very much up in the air. Hindmarsh. The only new counting today is the first batch of absents, and while there are only 402 of them, they bear out the notion that absent votes will settle the deal for Labor, breaking 64.4% in their favour. Now that postals are in in very substantial numbers, I’ve tweaked the model so that outstanding postals are determined half with reference to the count so far, and half from the difference between postals and ordinary results from 2013, rather than just the latter as before. This makes a substantial difference in only one seat, but the exception is important, as it pushes the Coalition up to 77. That seat is Herbert, where the strong show from the Coalition on postal votes had worn the projected Labor margin down to 54 before the adjustment was applied. The first absent votes have begun being counted, but so far not in any of the seats that matter. Capricornia. Yesterday I noted that the first batch of 1948 postals from Capricornia was the first I’d observed in which the Coalition fell below the projection. That hasn’t been repeated in today’s batch of 1484, which in breaking 59.2% to the Coalition have brought the overall postals total to exactly where the projection had it. Ordinary vote rechecking added 40 votes for Labor and 24 votes for the Coalition. The overall picture is little changed on yesterday, with the LNP projected to win by between 500 and 600. The raw vote is catching up with the projection, with Labor’s lead down from 732 to 476. Cowan. Good news and bad news today for the Liberals. The bad news came from ordinary vote rechecking, which knocked 112 from the Liberal total and 30 from Labor’s. The good came from a second batch of 1367 postals, which cut the raw Labor lead from 701 to 534 by breaking 59.1% in the Liberals’ favour. This compares with 53.9% from yesterday’s batch of 1386 and 54.8% as credited to them in the projection. However, there are too few postals outstanding for this to constitute a trend that might offer them encouragement, and Labor remain favoured to win. Flynn. I’ve been a bit cautious in my commentary about Flynn, given the mismatch between the raw results and my projected totals. But the longer the count goes on, the better the projection of an LNP victory looks. A third batch of postals was added today, this time accounting for 1949 votes, and the LNP received 62.8% of them, cutting Labor’s lead on the raw count from 927 to 646. However, there’s at least some encouragement for Labor in that the Coalition has trended downwards over the three batches added so far, from 65.3% to 64.2% to 62.8%, with around half still outstanding. Even so, the projection leaves the Coalition with a final lead of 970 — a fair bit higher than yesterday due to an error I made when increasing the projected total number of postal votes. Forde. 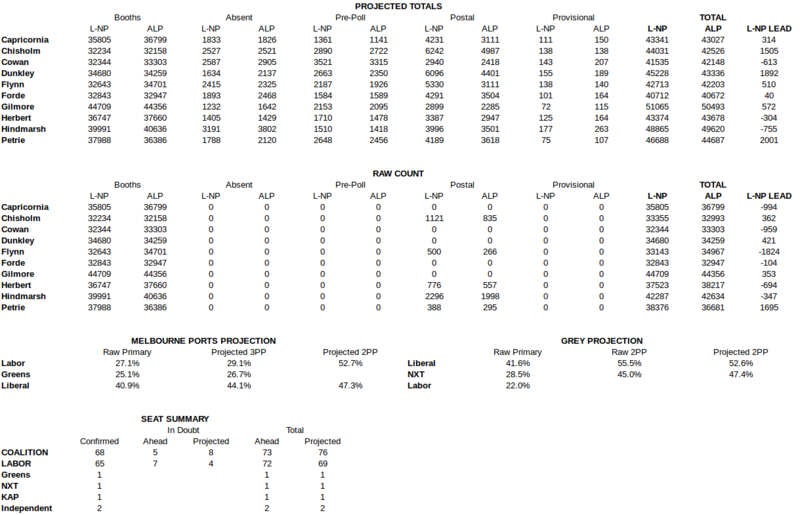 A big batch of 3905 postals were added today, and they continue to land bang on the projection, in this case at 55.5%, increasing the LNP’s raw lead from 265 to 687. I’ve also revised upwards the anticipated number of postal votes up fairly substantially, which increases the projected LNP winning margin from 164 to 552. Herbert. A second big batch of postals, this time 4247 of them, wasn’t quite as good for the Coalition as yesterday’s, but still caused Labor’s raw lead to come down from 620 to 449. As noted in the introduction, the methodological tweak now results in the LNP making it over the line, such that Labor will need above-projection results on absents and pre-polls to stay in front. Hindmarsh. The Liberals poked their nose in front for a brief time today on the raw count, but the projection continues to take the view that absents will bring home the bacon for Labor, having favoured them by 4.0% relative to ordinary votes in 2013. The Coalition is slightly outperforming the projection on postals, today’s batch of 1443 breaking 55.0% in their favour, but not by enough to do the job for them without a substantially above-projection result on absents. Rechecking of ordinary votes also caused the Liberals to suffer a net loss of 60. I’ve scratched Petrie, Gilmore, Dunkley, Chisholm and Grey from my watch list, with all of them called for the Coalition. Cowan and Hindmarsh appear likely to be won by Labor, but they are still on the watch list for now. That leaves four seats that are highly doubtful, all of them in Queensland — Capricornia, Flynn, Forde and Herbert, suggesting a range of possible final outcomes for the Coalition from 74 to 77. I’ve changed the estimated number of postal votes cast based on the AEC’s data for number of votes cast, with the adjustment in each case being upwards. Since postal votes favour the Coalition, this has been to their advantage in each case, though not to the extent of changing any leads. Knowing how variable the daily pattern of postal vote counting can be, I am continuing to estimate that outstanding postal votes will differ from ordinary votes as they did in 2013, rather than projecting them off the postals count so far at this election, which might be thought a little generous to Labor. Capricornia. The first batch of postals was finally added today — 1948 out of what should be around 9000 — and they are the first lot where the Coalition has underperformed the projection, breaking 54.4% rather than 57.6%. Since I’m continuing to use projections based on the 2013 pattern for uncounted postals, this is one seat where the projection might well be too favourable to the Coalition. In short, this is very much too close to call. Cowan. Postals are still closely matching the projection, today’s batch of 1386 breaking 731-655 to Liberal. Both the raw and projected Labor winning margins have consistently been at around 700, so there will need to be surprises in store on absents and out-of-division pre-polls for Labor to lose. Flynn. 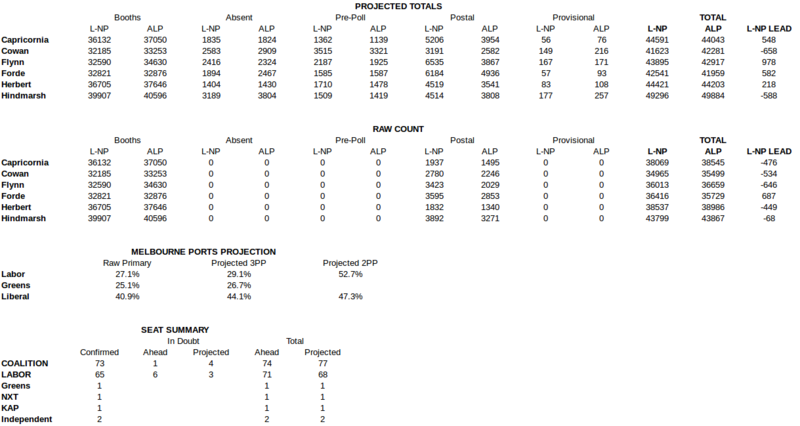 The LNP continues storming back here on postals, with today’s batch breaking 1748-989 their way, slicing the raw lead from 1686 to 927, and maintaining the projected LNP winning margin of over 500. Labor nonetheless maintains a raw lead of 927, and thus certainly shouldn’t be written off. The seat is now finally on the ABC’s seats in doubt list. Forde. This one remains lineball, with the first 2543 postals well in line with the projection, with 56.1% going to the LNP. There remain an estimated 5000-plus postals to be counted, so a change in the trend would make a substantial difference to the final result. Rechecking of ordinary votes has delivered Labor another hit, for a net loss of 60. Herbert. The second batch of postals is much like the first, breaking 1261-940 in favour of the LNP, so the presumption that outstanding postals will follow the 2013 pattern is probably flattering Labor. Since the projection credits them with a fragile lead of 272, this seat remains very much in play. Hindmarsh. The second batch of postals consisted of 1426 votes, of which 54.2% went to the Liberals, in line with both the previous batch and the projection. Further counting of postals could well put the Liberals into the lead, but Labor will do a lot better on absents and look likely to gain the seat. Capricornia. Rechecking of ordinary votes turned up nothing of consequence. Chisholm. Already a likely Liberal gain, the Coalition received 57.3% from the first 1956 out of what should be about 11,000 postals, compared with my projection of 55.2%. Nothing of consequence on rechecking of ordinary votes. Dunkley. A slight change was made to the result from one of the pre-poll voting centres, but otherwise nothing doing. Flynn. 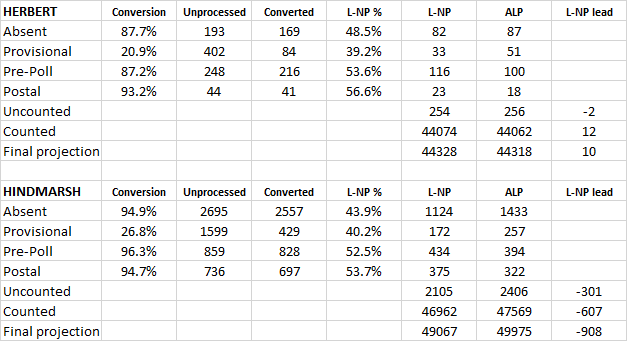 There are only 766 of them, from what should be a total of about 8500, but the LNP outperformed a postal vote projection I was wary about crediting yesterday — 16.8% better than ordinary votes, compared with 14.5% in 2013. Forde. Rechecking produced a net gain of 51 for the LNP, which wouldn’t ordinarily amount to much, but this one is so close it’s caused the projected winner to change. Gilmore. One bit of good news for Labor is that rechecking gave them a net improvement of 52, although they’re still behind on both the raw and projected results. Herbert. The LNP’s chances of chasing down their deficit look to have improved after they picked up 58.2% from the first 1333 out of what should be about 6500 postals, compared with the 52.2% projected yesterday. What looks to have been partial rechecking of ordinary votes turned up nothing of interest. Hindmarsh. Good progress here in counting of postals, accounting for 4294 from what should be a total of around 7500. The result is the closest of the bunch to yesterday’s projection, coming out at 53.5% compared with 53.1%. A very small amount of ordinary vote rechecking was also done. Petrie. The Special Hospital Team votes were added to the count, which is something my projections yesterday didn’t account for in any way, and they’ve broken 1265-797 in favour of the LNP. Given the ordinary vote total is used as the baseline for calculating declaration vote, this also causes the latter to shift in the LNP’s favour. The LNP also got 56.8% from 683 out of what should be around 8000 postals, compared with yesterday’s projection of 53.1%. Grey. The NXT needed about 75% of preferences to overhaul the Liberals here, but with two-party counts now conducted in 34 out of 124 booths, they’re only getting 58.3% of them. I expect I’ll be taking this one off the watch list pretty soon. Melbourne Ports. No new counting. Fully updated accounting below — click on image to enlarge. With counting of postal votes finally set to crank up today, this thread will be used to crunch the numbers and project results in the crucial late phase of the count. Below is a detailed accounting of how the situation will look if the various types of declaration vote behave as they did in 2013, relative to the ordinary vote results. Some guess work has also been required to estimate the total numbers of each type of vote cast. The relevant data from the AEC is patchy at present, but from what’s available I’ve estimated that out-of-division pre-polls will be up 44%, postals down 6% and absents unchanged. For reasons stated in the previous post, I’m a little more dubious about this exercise in Flynn than I am in the other electorates, so I’m not willing to state with confidence that Labor’s current 2058 vote will indeed disappear there – but nor do I think Labor is anything like as comfortable there as that total suggests. With Flynn currently included in a projected total of 75 seats, this is no small matter. Click on the image below to enlarge. A deep look at federal election swings, plus a few meagre snippets of post-election polling news. • ReachTEL has published a helpful table illustrating pollster accuracy, which is sporting of them given the attention it calls to the eye-watering accuracy of Newspoll. However, all concerned did very well in predicting a two-party preferred result which, by my back-of-envelope reading, will ultimately settle at around 50.5-49.5 to the Coalition. Essential and especially Ipsos overshot on support for the Greens, with the latter landing around 2% too low for both major parties, but the only other substantial errors involved the balance of support between the Liberals and the Nationals, which I don’t regard as particularly important. Electorate polls were a different matter, and will be looked at in greater detail when all the results are in. • On the Tuesday evening following the election, Roy Morgan conducted an SMS poll poll from 3587 respondents on leadership approval. The poll had Malcolm Turnbull with a narrow 51-47 lead as preferred prime minister, which the Morgan release sets up for comparison with a 57-24 result from May. However, the May result was an interviewer-administered phone poll, a method evidently less conducive to a “neither/can’t say” response. The poll also found Malcolm Turnbull leading Tony Abbott by 71-25 as preferred Liberal leader, and Anthony Albanese leading Bill Shorten 49-48 for Labor. Now to an exercise I’ve conducted to get a clearer sense of what sort of areas did and didn’t swing. 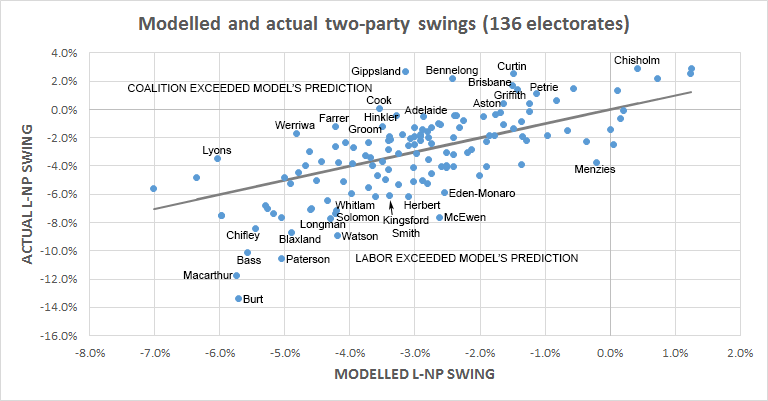 The chart below shows results of a regression analysis on 6582 polling booth results in which two-party swing data was available, which excludes the 14 electorates where the AEC’s two-party count is not between Labor and the Coalition. The purpose here is to discern if the swing to Labor was more or less evident in areas with particular demographic characteristics. The results record a big move back to Labor in the ever-volatile mortgage belts; an apparent failure of the Abbott-to-Turnbull leadership switch to improve the Coalition’s standing in ethnic communities; and better swing results for the Coalition where voters were wealthier and better educated, and – perhaps more surprisingly – older. After the constant and starting with “Age”, the table lists the associations between polling booth swings to the Coalition, which in practice usually means negative results recording swings to Labor, and five demographic variables for the census districts in which the booths were located. All but one of these variables, English spoken at home, records a statistically significant association with the swing, as indicated by a score of less than .05 in the significance column on the right. The “B” coefficient of .001 for “Age” tells us that areas with a median age of 40 would generally swing 1% more favourably for the Coalition than areas with a median age of 30. “MFY” stands for median weekly family income and is measured in thousands, so the coefficient means swings tended to be 0.3% stronger for the Coalition for every $1000 of average household income. “School” represents the percentage of the 18-plus population who had completed high school, every point of which associates with nearly 0.1% of swing in favour of the Coalition. 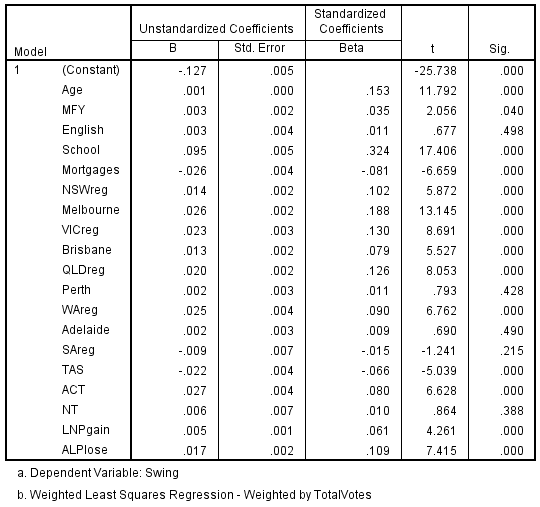 Conversely, Labor did 0.02% better for every percentage point of mortgaged dwellings. The five demographic variables are followed by geographic ones that are there to ensure the results for the demographic variables aren’t influenced by regional differences in the swing, particularly those from state to state. Sydney is excluded so it works as a baseline, so the coefficient for Melbourne tells us that the Coalition would typically do 2.6% better there than at a demographically identical booth in Sydney. Finally, two variables are listed to control for retiring member and sophomore surge effects, which prove to be significant in both cases. “LNPgain” was coded 1 where the candidate was a Coalition sophomore and -1 where a Coalition member was retiring; vice-versa in the case of Labor sophomores and retirees; and zero where neither applied. “ALPloss” was coded 1 where Labor lost the seat in 2013 and 0 otherwise, to measure the boost to the sophomore effect in seats where Labor had a sitting member defending last time. The results suggest Coalition members who won their seats from Labor in 2013 did 2.2% better in swing terms than other Coalition candidates, which reduces to 0.5% in seats where they were replacing retiring Coalition members. To observe these effects in action, the four tables below identify the 15 highest and lowest ranked electorates by the four statistically significant demographic indicators, and show their two-party swings to the Coalition where available. The lowest education electorates, all of which are regional, were 4.0% worse for the Coalition than those at the top of the scale, of which all apart from Fenner in the ACT are near the centres of the largest cities. Median age was more of a mixed bag — old electorates are regional, but the young ones encompass inner cities, mortgage belts, enclaves, a defence town and the largely indigenous seat of Lingiari. Nonetheless, the distinction here is as great as it was for education, and not in the direction that might have been anticipated from a touted backlash over superannuation policy. The lowest income electorates, all of which are regional other than two in Sydney, recorded an average 3.5% swing to Labor, only slightly above the national result. But the results for the Liberals were well above average among the wealthiest electorates, over half of which swung in the Coalition’s favour. The mortgage effect is more modest, with 2.8% separating the averages for the top and bottom fifteen. Electorates at the top end of the mortgaged dwellings table are all in the outer suburbs of big cities, but the bottom end is a dissonant mix of regional and inner-city areas, producing a wide range of swing results. The extent to which this exercise actually explains the results is illustrated by the chart below. For each electorate, the result the model would have predicted is plotted on the horizontal axis, and the actual result is plotted on the vertical. The electorates identified by name are those where the Coalition most under-performed or over-performed the prediction. Keep in mind that this accounts for regional as well as demographic factors, so Lyons shows up as a strong Liberal performance because the swing there was lower than in the other three Tasmanian seats included (remember Denison is not included due to its lack of two-party swing figures). Most electorates’ results were within 2% of the prediction, but a good many had results where alternative explanations are substantially required.